If you've ever encountered an issue while trying to install a Windows update, you'll probably know what a frustrating process it can be to diagnose and resolve the problem. Microsoft's support documentation for dealing with the error codes generated by such issues isn't always helpful; and information shared by the user community on its support forums can be useful, but is often undermined by conflicting (and sometimes ill-informed) suggestions. Web searches for info on error codes are often a waste of time, and regularly lead to 'solutions' that do more harm than good. So it's certainly welcome to see Microsoft try to make this whole process a bit easier to deal with, by offering a troubleshooting tool to help users address issues that arise when trying to install Windows updates. 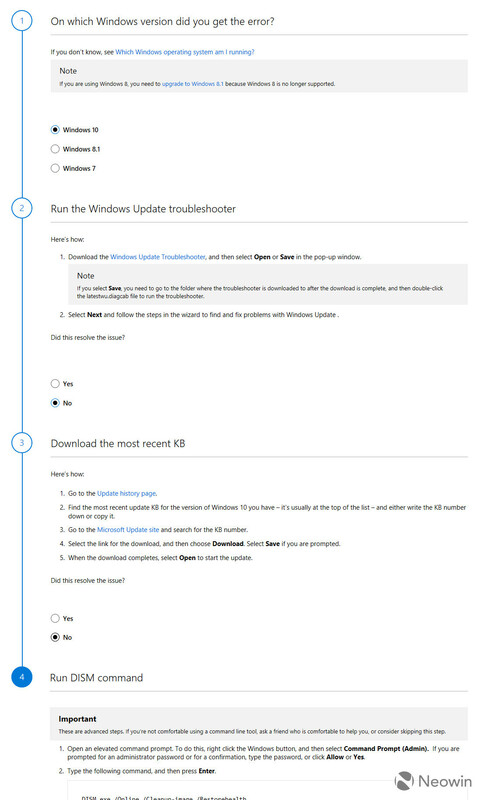 The troubleshooter offers support for Windows 7, Windows 8.1 and Windows 10, but notes that "if you are using Windows 8, you need to upgrade to Windows 8.1 because Windows 8 is no longer supported." The tool will take you through various steps to try to fix the problem - such as downloading and running the Windows Update Troubleshooter, installing the latest update manually, or more complex suggestions - before eventually advising that "you need to reset or reinstall" Windows if none of its other recommendations are successful. So far had zero problems with updates. I currently use the getting updates from other sources option. Usually using WSUS update utility when in trouble but will check this out in a week or so when I plan for my yearly reinstall. If I encounter issues that is. I've encountered a first time error on the cumulative update which successfully revert automatically to normal state; fortunately when I repeated the process then it managed to installed properly. Well if I were to Microsoft then return the option about 'asking to download the update first. Microsoft to fix Windows XP update SVCHOST redline issue 'soon'.